Nanopowders – agglomerates of ultrafine nanoparticles or nanoclusters – are of great scientific interest as they are effectively a bridge between bulk materials and atomic or molecular structures. 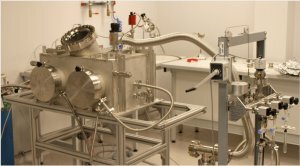 Various preparative techniques such as metal combustion, chemical vapour synthesis or sol-gel processing are applied in our lab in order to fabricate samples of nanopowders with relatively uniform properties. Their characterization is conducted via spectroscopic studies which aim at the identification of surface sites in terms of their electronic and geometric structure. This can allow us to elucidate their role in diverse processes ranging from heterogeneous surface chemistry to optical and electronic applications. Figure : transmission electron micrographs of various nanopowders synthesized in our Lab. Pure metal oxides (such as MgO, ZnO) : to obtain nano-powders with high specific surface area and to control the abundance and nature of the sub-coordinated reactive sites (steps, corners) through the synthesis conditions. Mixed metal oxides (MgxZn1-xO) : to obtain nanomaterials with new properties : optical, catalytic, antibacterial. Supported noble metal nanoparticles (Ag / MgO, Au / MgO) : to study the epitaxial relationships and forms of equilibria of metallic nanoparticles on complex surfaces of MgO. FTIR spectroscopy in transmission/reflection mode for the analysis of surface sites with probe molecules (H2, CO, H2O) in a pressure range from 10-7 à 103 Pa.
Photoluminescence spectroscopy : light-induced processes occurring at the surface sites. Transmission electron microscopy (TEM) : morphology studies. To produce our nanopowders we use three different modes of synthesis : by combustion, fumes (glove box, see figure), by CVD (home-built) and by sol-gel methods.